But that's not what I meant to say . . . In the past few years, I've noticed a dangerous trend. People send emails and texts without even reviewing them. I call them "fly bys." Devices with "autocorrect" turn intended words into unintended words, destroying the meaning of the email and perplexing the recipient. What is so different about a business text or an email (as opposed to a business letter) that makes it acceptable to be reckless? I discovered the hard way that even an OCR document scan can change the word "herein" to "heroin" without warning. Sigh. If you've ever seen email or text faux pas, you know what I mean. They can be staggering. When you adopt the "anything goes" attitude in any business scenario, it shows immaturity. ​Business communication should always be respectful, whether it is with an employee, a colleague, or a prospective client. Remember - don't hit the "Send" button without a quick review! I still deal with this on occasion. Briefly, effect is generally a noun, and affect is generally a verb. The weather could affect ( verb) the picnic on Sunday. What effect ( noun) will your training have? 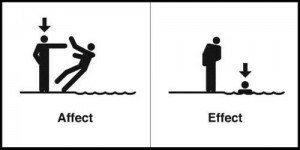 If you put an a, an, or the in front of the word, it's spelled effect. Affect is the cause of something. Effect is the result of something. 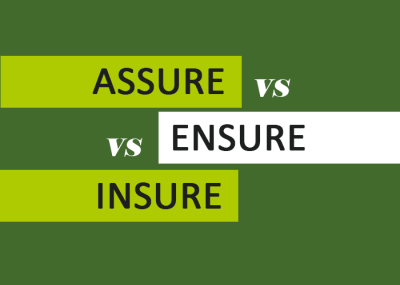 Insure is used to provide financial liability for an automobile or home. Ensure is used when you want to guarantee something. Assure is used only in the context of encouraging an adult, child, pet. You insure your car, and you ensure that you have car insurance. You assure your parents that your car insurance is paid.